When was the last time you had a conversation about cornbread? Let me explain what this has to do with DATA! There are two cornbread camps, and the one you fall into can reveal a lot about your marketing. I will explain this claim later in this article and why my friend Fran likes to make cornbread in an aluminum pan but when it comes to marketing her small business she opts for a well thought out plan based on carefully appended data – the cornbread equivalent of baking in a cast iron skillet. 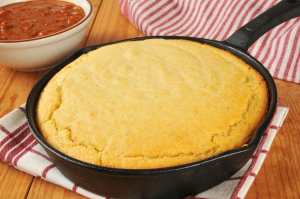 By focusing on quality, long-term customer loyalty, and strategic marketing decisions that are based on aggregated data, you’re sure to achieve results as delicious as cast iron cornbread. Check out the following case study to see what I mean…. While getting to know their customers, our client discovered that a particular female customer segment was made up of married mothers, not single women as they had originally thought. After reviewing the data on this segment, Massa & Company helped our client create a marketing model that spoke directly to what this particular customer base wanted. While other segments were sent a mailing featuring images of “clubbing” clothes and accessories, the mommy customer segment received a mailing featuring comfortable loungewear, exercise clothing, and more conservative evening dresses. We also created a targeted email campaign that featured multiple images of retail products complemented by warm, family-friendly text and fresh-looking graphics that would appeal to the young mom demographic. The point of collecting data on your customers is not just to find out what they want, but to give them what they want – to show them that your company has exactly what they’re looking for. Your marketing then becomes part of an ongoing conversation with your customer, instead of an intuition-based sales message. Just like cornbread in a box, it may seem quicker and easier to send every customer the same marketing message, or to collect a bunch of data without turning that data into actionable insights. But like the extra TLC it takes to make cast iron cornbread, the extra mile you go for your customer pays for itself threefold: in the form of increased revenue, decreased marketing spend, and the cultivation of a loyal, lifelong relationship with each and every customer segment. Do you have data but aren’t sure what to do with it? To turn your data into an actionable model that can predict your customer’s next move, contact Bonnie at (312) 463-1050 or by clicking here now. As for cornbread revealing a lot about your marketing, take my friend Fran, for instance. Fran grew up in Chicago making yellow cornbread that comes from a box. In order to make her cornbread, Fran just adds water and bakes the bread in an aluminum pan. It’s quick and easy but, in my humble opinion, it’s a far cry from what Big Benders like me think of as “real” cornbread. I’m from Tennessee and grew up on white cornbread baked in a cast iron skillet. I make it from scratch with simple, pure ingredients like eggs, buttermilk, and shortening. Before mixing up the cornmeal, egg, and buttermilk in a bowl, turn the oven to 425 degrees. Put the shortening in an 10” cast iron skillet (properly seasoned, of course). Place the skillet in the oven as it pre-heats. Mix other ingredients in a medium mixing bowl. Once shortening has melted, remove skillet from the oven and carefully swirl the melted shortening around the sides of the skillet to coat. Pour the shortening into to the bowl of ingredients and mix. Pour contents of the bowl into the skillet and bake for 20-25 minutes. Remove from oven and let cool for 3 minutes then flop the cornbread out of the pan onto a plate and butter immediately.